The MIL-STD-1553 Trigger Decode (TD) and Trigger, Decode, Measure/Graph and Eye Diagram (TDME) solutions both provide high performance triggers and transparent color-coded decode overlays, protocol tables, and search capabilities. The TDME option also provides Measure/Graph (M) capability with automated measurement and graphing tools and Eye Diagram (E) capability for physical layer signal assessment and debug. ARINC429bus DSymbolic The ARINC 429 Decode (D) option provides Symbolic decode with transparent color-coded decode overlays, protocol tables, and search capabilities. ARINC429bus DME Symbolic The ARINC 429 Decode (D) and Decode, Measure/Graph and Eye Diagram (DME) options both provide Symbolic decode with transparent color-coded decode overlays, protocol tables, and search capabilities. Measure/Graph (M) provides automated protocol-specific bus performance, timing, and digital data extraction measurements and waveforms. Eye Diagram (E) provides one button eye diagram creation from the physical layer signal, various eye measurements and pass/fail indications/debug. AudioBus - I2S Teledyne LeCroy’s Serial AudioBus trigger, decode, and graph package provides all the tools needed to properly analyze and debug digital audio buses. Teledyne LeCroy’s solution addresses the I2S, LJ, RJ, and TDM variations of the audio bus standard. MDIO Decode The Media Data Input/Output (MDIO) decoder provides a fast and easy way to understand and correlate MDIO bus traffic to the management of PHYs or physical layer devices in media access controllers (MACs). 14GBIT-80B-SYMBOL-TD Rapidly pinpoint and debug problems with NRZ, 8b/10b and 64b/66b signals using the high-speed serial trigger and decode options. Hardware trigger products with maximum bitrates of 6.5 and 14.1 Gbps are available for WaveMaster 8 Zi-A, LabMaster 9 Zi-A and LabMaster 10 Zi series oscilloscopes, and include 8b/10b and 64b/66b decoders. 1553 TD The MIL-STD-1553 Trigger Decode solution provides high performance triggers and transparent color-coded decode overlays, protocol tables, and search capabilities. 1553 TDME The MIL-STD-1553 Trigger Decode solution provides high performance triggers and transparent color-coded decode overlays, protocol tables, and search capabilities. Automotive Bundle Trigger and Decode The Automotive Bundle Trigger and Decode is offered for selected oscilloscope product lines only. In all supported product lines, it contains the capabilities included in CANbus TD and LINbus TD, and some oscilloscope product lines also support FlexRaybus TD as well (reference oscilloscope product lines for complete support). For more information on this product, please see the product pages for CANbus TD, LINbus TD, and FlexRaybus TD. CAN FDbus TD The CAN FD Trigger Decode (TD) solution provides high performance triggers and transparent color-coded decode overlays, protocol tables, and search capabilities for both CAN and CAN FD. CAN FDbus TDME The CAN FD Trigger, Decode, Measure/Graph and Eye Diagram (TDME) solution provides high performance triggers and transparent color-coded decode overlays, protocol tables, and search capabilities, Measure/Graph (M) capability with automated measurement and graphing tools, and Eye Diagram (E) capability for physical layer signal assessment and debug for both CAN and CAN FD. Symbolic DBC files may be used to set up the trigger, display symbolic decodes, and select parameters for serial digital data extraction to an analog value. CAN FDbus TDME Symbolic The CAN FD Trigger, Decode, Measure/Graph and Eye Diagram solution with Symbolic support (TDME Symbolic) provides high performance triggers and transparent color-coded decode overlays, protocol tables, and search capabilities, Measure/Graph (M) capability with automated measurement and graphing tools, and Eye Diagram (E) capability for physical layer signal assessment and debug for both CAN and CAN FD. Symbolic DBC files may be used to set up the trigger, display symbolic decodes, and select parameters for serial digital data extraction to an analog value. 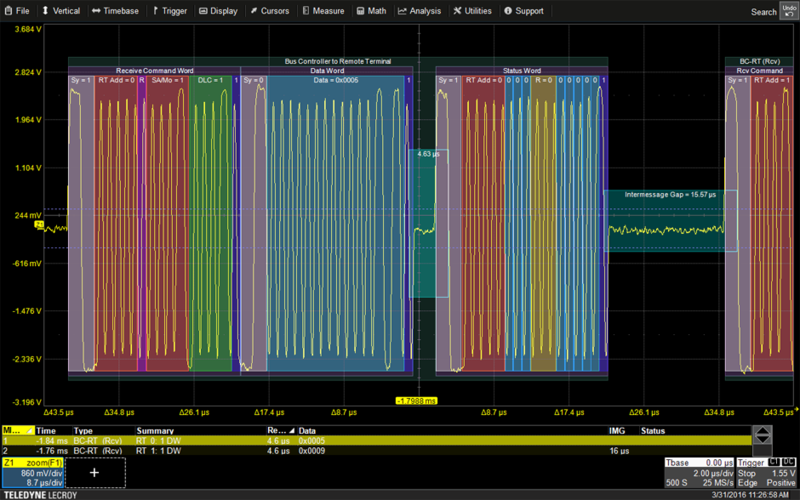 CANbus TD performance triggers and transparent color-coded decode overlays, protocol tables, and search capabilities. CANbus TDME The CAN Trigger, Decode, Measure/Graph and Eye Diagram (TDME) solution provides high performance triggers, transparent color-coded decode overlays, protocol tables, and search capabilities, Measure/Graph (M) capability with automated measurement and graphing tools, and Eye Diagram (E) capability for physical layer signal assessment and debug. D-PHYbus D - Decode option The MIPI D-PHY decode is the ideal tool for powerful system level protocol debug as well as problem solving for signal quality issues. The D-PHY decode solution adds a unique set of tools to your oscilloscope, simplifying how you design and debug MIPI D-PHY, CSI-2 and DSI signals. D-PHYbus DP - Decode and Physical layer test option The MIPI M-PHY and D-PHY Decode and Physical Layer Test is the ideal tool for powerful system level protocol debug as well as problem solving for signal quality issues. The D-PHY decode solution adds a unique set of tools to your oscilloscope, simplifying how you design and debug MIPI D-PHY, CSI-2 and DSI signals. DigRF 3G bus The DigRF 3G decode is the ideal tool for powerful system level protocol debug as well as problem solving for signal quality issues. The DigRF 3G decode adds a unique set of tools to your oscilloscope, simplifying how you design and debug MIPI digital RF systems. DigRF v4 bus The DigRF 3G and v4 decode are the ideal tools for powerful system level protocol debug as well as problem solving for signal quality issues. The DigRF decodes add a unique set of tools to your oscilloscope, simplifying how you design and debug MIPI digital RF systems. Embedded System Bundle TD The Embedded Bundle Trigger and Decode (TD) contains the capabilities included in the I2Cbus, SPIbus, and UART-RS232bus TD products. For more information on this product, please see the product pages for I2Cbus TD, SPIbus TD, and UART-RS232bus TD. Embedded System Bundle TDME The Embedded Bundle Trigger, Decode, Measure/Graph and Eye Diagram(TDME) contains the capabilities included in the I2Cbus, SPIbus, and UART-RS232bus TDME products. For more information on this product, please see the product pages for I2Cbus TDME, SPIbus TDME, and UART-RS232bus TDME. Ethernet Decode Ethernet Decode Ethernet decoding provides protocol awareness to the oscilloscope for fast debugging. Fibre Channel Decode The FCbus D decode annotation option is available for most Teledyne LeCroy oscilloscopes. It permits link and data layer decoding of 1, 2, 4, or 8GFC (1.0625 Gb/s to 8.5 Gb/s) Fibre Channel physical layer signals. FlexRaybus TD The FlexRay Trigger Decode (TD) solution provides high performance triggers and transparent color-coded decode overlays, protocol tables, and search capabilities. FlexRaybus TDMP The FlexRay Trigger Decode (TD) and Trigger, Decode, Measure/Graph and Physical Layer (TDMP) solutions both provide high performance triggers and transparent color-coded decode overlays, protocol tables, and search capabilities. The TDMP option also provides Measure/Graph (M) capability with automated measurement and graphing tools and Physical Layer and Eye Diagram (P) capability for advanced physical layer signal assessment and debug. I2Cbus TD The I2C Trigger Decode (TD) solution provides high performance triggers and transparent color-coded decode overlays, protocol tables, and search capabilities. I2Cbus TDME The I2C Trigger, Decode, Measure/Graph and Physical Layer (TDME) solution provides high performance triggers, transparent color-coded decode overlays, protocol tables, and search capabilities, Measure/Graph capability with automated measurement and graphing tools, and Eye Diagram capability for physical layer signal assessment and debug. LINbus TD The LIN Trigger Decode (TD) solution provides high performance triggers and transparent color-coded decode overlays, protocol tables, and search capabilities. LINbus TDME The LIN Trigger Decode (TD) and Trigger, Decode, Measure/Graph and Physical Layer (TDME) solutions both provide high performance triggers and transparent color-coded decode overlays, protocol tables, and search capabilities. The TDME option also provides Measure/Graph (M) capability with automated measurement and graphing tools and Eye Diagram (E) capability for physical layer signal assessment and debug. M-PHYbus D - Decode option The MIPI M-PHY and D-PHY Decode and Physical Layer Test is the ideal tool for powerful system level protocol debug as well as problem solving for signal quality issues. The D-PHY decode solution adds a unique set of tools to your oscilloscope, simplifying how you design and debug MIPI D-PHY, CSI-2 and DSI signals. M-PHYbus DP - Decode and Physical layer test option The MIPI M-PHY and D-PHY Decode and Physical Layer Test is the ideal tool for powerful system level protocol debug as well as problem solving for signal quality issues. The D-PHY decode solution adds a unique set of tools to your oscilloscope, simplifying how you design and debug MIPI D-PHY, CSI-2 and DSI signals. Manchester Decode Manchester coding is a line code in which the encoding of each data bit has at least one transition and 1s and 0s have equal bit width and therefore has no DC component. Manchester signals are self-clocking, which means that a clock signal can be recovered from the encoded data. Manchester Configurable protocol decoder enables grouping bits using various combinations of bit rate, polarity, idle condition, time out and more to decipherable messages. It allows decode of various protocols developed using Manchester encoding scheme. NRZbus D NRZ (non-return-to-zero) line code is a binary code in which 1s are represented by one significant condition (usually a positive voltage) and 0s are represented by some other significant condition (usually a negative voltage), with no other neutral or rest condition. NRZ Configurable protocol decoder enables grouping bits using various combinations of bit rate, polarity, idle condition, time out and more to decipherable messages. It allows decode of various protocols developed using NRZ encoding scheme. PCIe Decode The PCIEbus D option provides comprehensive PCI Express Gen1.x protocol decode for most efficient debug. ProtoSync The ProtoSync option further leverages the supported Teledyne LeCroy decode annotation options (PCIEbus D, USB3bus D, USB2bus D, USB2 HSICbus D, SATAbus D, SASbus D, FCbus D) installed on the oscilloscope. SAS bus D The SASbus D decode annotation option is available for most Teledyne LeCroy oscilloscopes. It permits link and data layer decoding of 1.5, 3, 6, or 12 Gb/s SAS physical layer signals. Decode information is annotated on the physical layer waveform. Various sections of the protocol are color-coded to make it easy to understand the protocol traffic. SATA Trigger and Decode The SATAbus TD option provides comprehensive SATA 1.5 and 3 Gb/s protocol triggering in a WaveRunner 6 Zi oscilloscope using a true hardware protocol trigger for most efficient debug. SENTbus D High-resolution SENT sensor and ECU message frames are intuitively decoded on the waveform, provided in an interactive table, and payload content search tools make debugging fast and effective. SpaceWirebus D The SpaceWire decode adds a unique set of tools to your Teledyne LeCroy oscilloscope that simplifies the design, debug, and maintenance of SpaceWire systems. 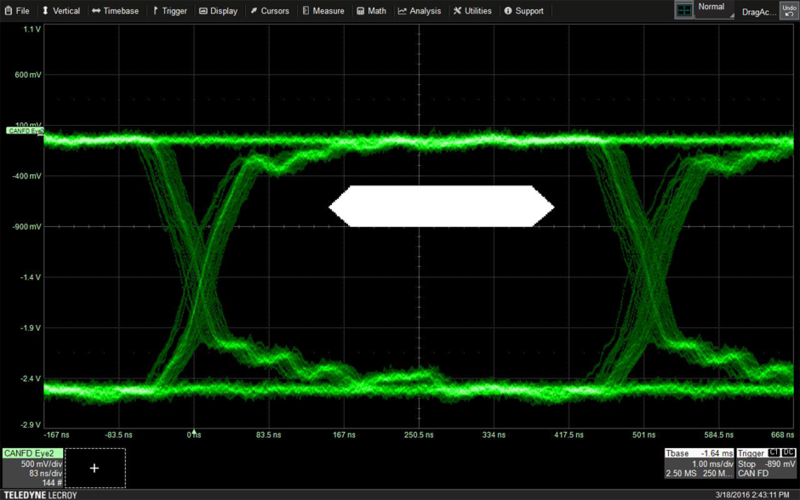 The high speed SpaceWire data stream is annotated directly on the physical layer waveforms. Various sections of the protocol are color-coded to make it easy to understand the protocol traffic. The decoder provides an interactive table, search, and zoom to make debugging fast and effective. SPIbus TD The SPI Trigger solution provides high performance triggers and transparent color-coded decode overlays, protocol tables, and search capabilities. SPIbus TDME The SPI Trigger, Decode, Measure/Graph and Physical Layer (TDME) solution provides high performance triggers and transparent color-coded decode overlays, protocol tables, and search capabilities. The TDME option also provides Measure/Graph (M) capability with automated measurement and graphing tools and Eye Diagram (E) capability for physical layer signal assessment and debug. SPMI Decode The MIPI System Power Management Interface (SPMI) decoder provides a fast and easy way to understand and correlate SPMI bus traffic to DC power rails and power management IC (PMIC) operations in mobile, handheld, and battery-powered embedded systems. UART-RS232bus TD The UART and RS-232 Trigger Decode solution provides high performance triggers and transparent color-coded decode overlays, protocol tables, and search capabilities. UART-RS232bus TDME The UART and RS-232 Trigger Decode (TD) and Trigger, Decode, Measure/Graph and Physical Layer (TDME) solutions both provide high performance triggers and transparent color-coded decode overlays, protocol tables, and search capabilities. The TDME option also provides Measure/Graph (M) capability with automated measurement and graphing tools and Eye Diagram (E) capability for physical layer signal assessment and debug. UNIPRObus D The MIPI UniPro Protocol Decoder analyzes acquired M-PHY analog waveforms and provides insight into multiple levels of UniPro protocol information. Data and Control frames are presented in an intuitive table format, where selecting a frame expands its content to a color-coded symbolic level, simultaneously creating a zoom. Decode annotation information is displayed on the physical layer waveform for a quick reference. USB 3.0 bus The USB 3.0 decode option for Teledyne LeCroy oscilloscopes provides link layer decode information annotated on the USB 3.0 physical layer waveform. This provides the ability to view protocol traffic on the oscilloscope and verify that the link is alive and transmitting properly. It also aids in debugging problems that are not solely analog or digital in nature, such as interoperability issues, uncertain error causes, and physical layer issues not evident with a Protocol Analyzer. USB2-HSICbus D The comprehensive and intuitive deocde and easy to navigate table display enable a powerful toolset to quickly debug a USB 2.0 HSIC powered system. Combine it with ProtoSync to get a full view of all the USB 2.0 layers. USB2bus TD performance triggers and transparent color-coded decode overlays, protocol tables, and search capabilities. USB2bus TDME The USB2 Trigger, Decode, Measure/Graph and Physical Layer (TDME) solution provides high performance triggers (T) and transparent color-coded decode overlays, protocol tables, and search capabilities (D). The TDME option also provides Measure/Graph (M) capability with automated measurement and graphing tools and Eye Diagram (E) capability for physical layer signal assessment and debug. T3DSO2000-TD Программная опция декодирования сигналов I2C, SPI, UART/RS232, CAN, LIN. The MIL-STD-1553 trigger can be configured at the transfer or word level to provide the right level of triggering. In addition, error triggers are able to locate the cause of protocol errors at either the transfer or word level. Word level triggering allows conditional RT Address and Sub Address entry. The trigger permits a conditional (<. <=, =, >, >=, <>, inside a range, outside a range) setup for the DATA condition. This is especially useful in situations where abnormal events should be monitored. A transparent overlay with color-coding for specific portions of each protocol and the entire message frame makes it easy to understand your serial data information. Unlike other solutions, with protocol decode information away from the signal, our solution correlates the waveform and the protocol decode directly on the display. As the acquisition length is expanded or shortened, the decode overlay will adjust to show you just the right amount of information. 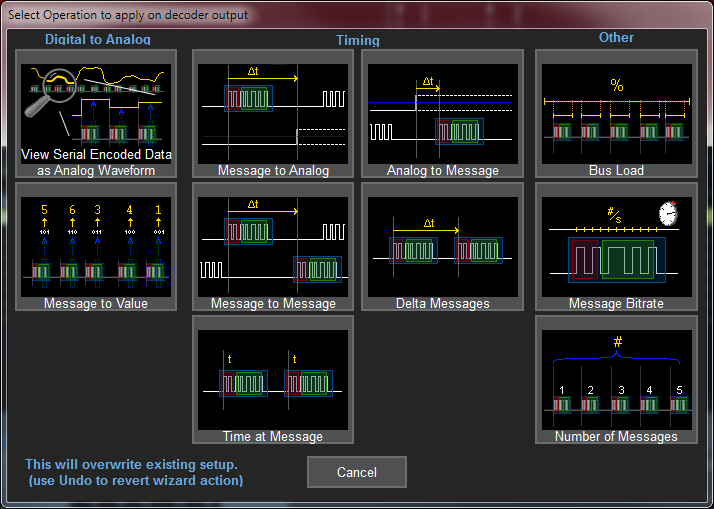 Turn the oscilloscope into a protocol analyzer with a tabular display of decoded information. Customize the table to show only the data of interest and touch a message in the table to automatically zoom to it and display it on the screen. Export the table for offline analysis. 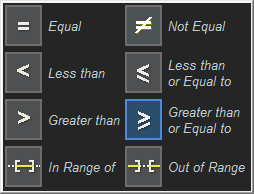 Up to four different decoded signals of any type may be simultaneously displayed in the table. Quickly validate cause and effect with automated timing measurements to or from an analog signal or another serial message. Make multiple measurements in a single long acquisition to quickly acquire statistics during corner-case testing. Serial (digital) data can be extracted to an analog value and graphed to monitor system performance over time, as if it was probed directly. Complete validation faster and gain better insight. Rapidly display an eye diagram of your packetized low-speed serial data signal without additional setup time. Use eye parameters to quantify system performance and apply a standard or custom mask to identify anomalies. Mask failures can be indicated and can force the scope into Stop mode.